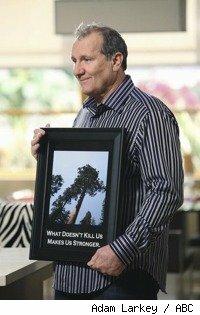 Ed O’Neill talks about Modern Family, Married With Children, how he got into comedy, his theater work and finally being accepted by his peers among other things. It’s an interesting interview. Click here since the video won’t embed. In the spirit of the holidays, we want to hear about your family’s best holiday tradition. Submit your “best holiday tradition” by posting a comment to this post. One entry per person; if you submit more than one entry, you will be disqualified. Provide an email address in the “Email” field (not in the post itself). Giveaway rules are subject to change without any notice. This is a family-friendly site; please, no profanities or other inappropriate contributions. This giveaway is sponsored by SimchaBucks. Want to know how much money to spend on a wedding gift? Try Simchabucks’ wedding gift calculator. Ed O’Neill, beefy star of ABC sitcom “Modern Family,” says there’s nothing wrong with being overweight. His idea of health food? “I like wine,” he says proudly.